The term "Tiergarten" means "zoo" in German; however, the Lainzer Tiergarten has its name from the deer enclosure that was once to be found in this area. The forest in this part of the Vienna Woods served as hunting grounds for the Habsburg Emperors for centuries and thus, preserved its rural charm until today. In the 19th century, Emperor Franz Joseph I built a palatial villa in the Lainzer Tiergarten, the Hermesvilla. He built the villa for his wife Empress Elisabeth, better known as Sisi - in order to provide her with a leisure palace where she could do her horseback riding far from the behavioural codices that regulated life on the court. Essentially, it was an attempt to lure the Empress to Vienna in the hope that she would cut down on her excessive travels. The architect in charge was Karl of Hasenauer, who had also designed the Burgtheater Theatre. The construction was done between 1882 and 1886. There were several technical innovations implemented into the building: The road that ascended to the Hermesvilla was the first one in Vienna that was illuminated with electric street lights and in 1896, the Hermesvilla was equipped with a telephone connection. The building was named according to a marble statue of the Greek god of Hermes in the garden in front of the villa. The Imperial couple visited the Hermesvilla for the first time in 1886. At this point, the garden was not finished and the construction work had not been completed - it is said that the Empress was not amused. From 1887 onwards, she frequently spent a couple of days with her husband at the villa, but never really seemed to like it very much. One day before Empress Elisabeth was murdered in Geneva in 1898, Emperor Franz Joseph I wrote his final letter to her in the Hermesvilla. WWI passed without doing any damage to the Hermesvilla (or any building in Vienna, really, as the frontlines were far away in Galicia or South Tyrol), the Emperor died in 1916 and - long live the Emperor - a new one was crowned. With the end of WWI and the collapse of the Empire, the Emperor was thrown off the thorne and out of the country and all Habsburg property became subject of the Republic of Austria. Time passed on in the tranquil Lainzer Tiergarten, where the Hermesvilla rested peacefully throughout the World Economic Crisis, the Austrian civil war and the Anschluss. Even WWII didn′t do any harm to the Hermesvilla. Then the Soviets came. The Soviet troops occupied the building and (ab)used it until 1955. When they left, they took pretty much anything that was moveable - including doors, windows and even wallpapers. Not to mention furniture and artwork. The looted Hermesvilla was carefully restored after 1962. It took a long time to replicate the original 19th century appearance, but today the Hermesvilla once again presents itself in all its Imperial tackiness. 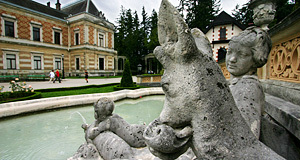 The Hermesvilla houses a restaurant and is a popular day-trip destination for many Viennese. It is run as a section of the Wien Museum and used for temporary art exhibitions. A couple of rooms that are laid out like they were when Franz Joseph I and Sisi had lived there (distastefully, that is). Continue with "Hermesvilla & Lainzer Tiergarten - Part II"